This post is my contribution to an international blog series called #ArchiTalks. Each month, dozens of architect bloggers publish a post on a specific topic simultaneously on the same date. 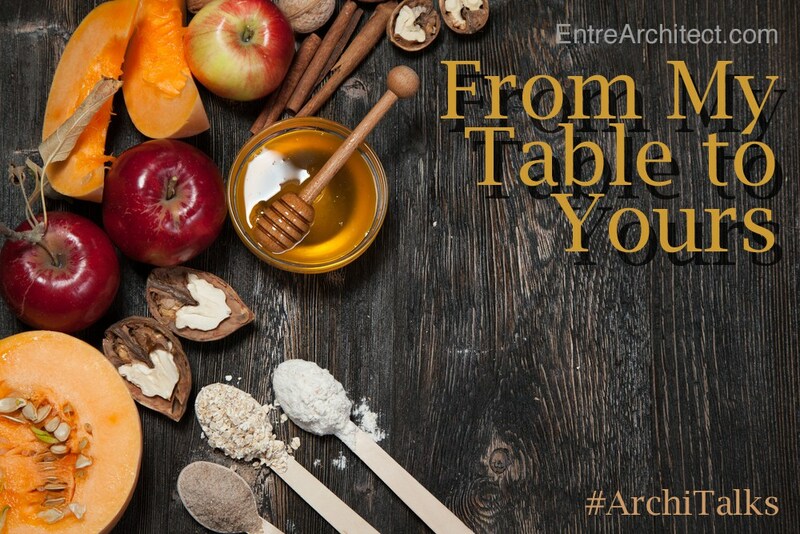 This is a bonus edition of #ArchiTalks, with a Thanksgiving theme, “From An Architect’s Table”, where each architect blogger will share a favorite holiday recipe. Scroll to the bottom for links to posts written by all of my #ArchiTalks friends. It starts in early September. The pools are closed, the kids return to school, the days get shorter and before you know it, the year is over. For me, every year goes by faster and faster. It feels like only yesterday that I was writing about setting your goals for 2015. From September through mid November, time really flies, but once we put away the Halloween pumpkins, we can pretty much blink and its over. Halloween leads into Thanksgiving. Thanksgiving rolls into Christmas (and all the other winter holidays) and Christmas is the beginning of the end of the year. Oh, and on top of all of that, we celebrate my oldest son’s birthday two days after Christmas. All of that celebrating takes coordination and scheduling. It takes deep breaths and calming thoughts. It’s a very busy time of year. It’s also my favorite time of year. I enjoy spending time with family and friends, as we shut down Fivecat Studio for the Christmas week through to the new year. The down time allows me a chance to review my year (both for the firm as well as my family), evaluate our success, confirm our goals and prepare for the new year to come. It’s a time when I become even more appreciative for the many blessings that have come my way. I am very thankful for my life and the path I have followed. I am filled with gratitude for the support and on-going encouragement that I have received from dozens of members from the EntreArchitect community. I thank YOU for being here each week and for reading the articles we publish. I thank you for listening to the podcast and for reviewing the newsletter. I thank you for spreading the word and for sharing the movement toward architects building better businesses that has begun and is rapidly growing here at EntreArchitect. At the end of each podcast episode you hear my call to action, “Share what you know!” For this Thanksgiving, I want you to stop working, spend time with your family and/or friends and let them know how much they mean to you. Share with them a special thought or an idea that will make their world a little bit better. Share what you know, with the ones that you love. So, in order to comply with this edition of #ArchiTalks, here’s my favorite recipe straight out of The Joy of Cooking. When Annmarie bakes this pie, it’s all that I need. I hope you like it too. Thank you… and I wish you and your family a very happy Thanksgiving. A tangy pie with a light, soufflelike texture. Position a rack in the center of the oven. Preheat the oven to 350°F. ArchiTalks: Bourbon. Every architect’s friend. Slowing down / Shutting down to take time to appreciate all we have is necessary, but all to often neglected. Thanks for the reminder to take time to not only be grateful, but to express it as well.